I thought last week’s post was going to be my last one on the topic of authority. But we still haven’t really talked about the big reason for Christians to use authority rightly (part one), to respond well to authority in the church (part two), and to respect worldly authorities (part three). We’re to do all this because we’re under God’s authority. Any time we rebel against or balk at one of of God’s commands (including the ones about respecting positions of authority), we’re questioning God’s authority. We’re rebelling against His right to tell us how we’re supposed to live. And that’s not something people who describe themselves as Christ-followers should be doing. We should be in awe of our God and treat Him with the utmost respect. Once you acknowledge Yahweh as your God, you should also recognize His rights as creator and ultimate authority in the universe. When we call Jesus Lord, we’re saying He’s our owner, master, and ruler (kurios, G2962). And if we’re going to call ourselves Christians, we need to live as if we really believe this is true. Not only does God have claim on us as our creator, He also claims the rights of a redeemer. You are part of “the church of God, which he hath purchased with his own blood” (Acts 20:28, KJV). We belong to God and He has absolute authority over every human life, whether we acknowledge His rights or not. 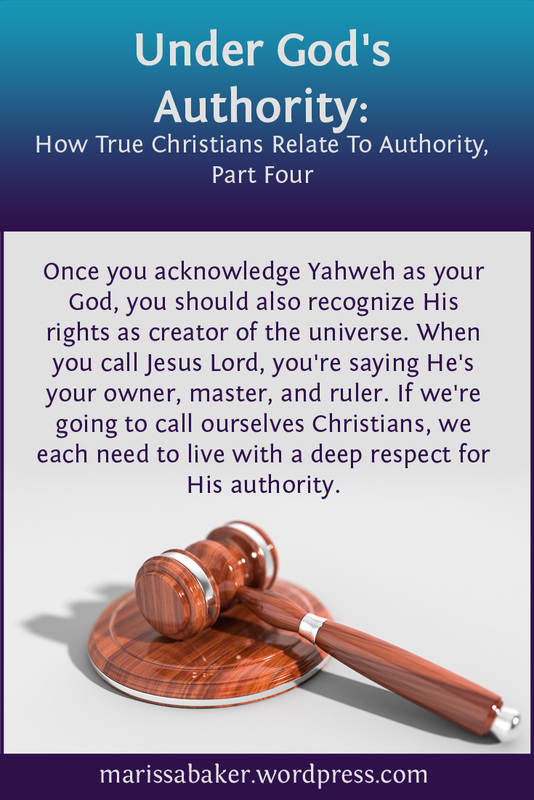 And for those of us who do know Yahweh as our God, we need to make sure we respect His authority. Sometimes it’s easier to show respect to other people than to truly respect God. With other humans, we have to interact with them personally and deal with the consequences if we don’t behave appropriately. We can see them and know we’re being seen and judged by how we present ourselves. For some reason, we don’t always give our all-seeing God the same respect. Perhaps because we can’t see Him and know He doesn’t always meet out punishment immediately, we think we can get away with disrespecting Him. We think, “He won’t mind if I work on the Sabbath just this once,” or “I really want to go to this concert; He won’t care if I use tithe money for tickets one time.” We decide not to give Him our best. We just give Him our spare time and spare change and feel good because we “did something” for God. But that’s not how you honor the Lord, Creator, and Savior of all things. God expects us to take Him seriously. He’s not a joke or an afterthought. When He says something He means it. When He asks us to do something, we must do it. When He asks for something, we must give it to Him. God doesn’t take this Authority on Himself. It’s inherent to Him. And He doesn’t ask things of us out of a despotic need for control. He set up this world, He knows how things work, and He’s asking us to choose life with Him because any other choice leads to death. God is love and He doesn’t want to see anyone perish. His law and expectations for us come out of that character. Jesus didn’t start a new religion when He came to this earth. He came as the next step in God’s plan; the continuation of what started in Genesis. And He didn’t destroy what He and His Father had already built. He expanded on it. God’s commandments are a guidebook for living in accordance with His character while we’re here on earth. And we have to find a way to keep them better than the obsessively religious people of Jesus’ day did if we want to live in His kingdom. The key to doing this is acknowledging the Lord’s authority. Jesus said “the whole law and the prophets depend on” two commandments (Matt. 22:40, WEB). The first is, “Hear, Israel, the Lord our God, the Lord is one: you shall love the Lord your God with all your heart, and with all your soul, and with all your mind, and with all your strength. : The second is, “You shall love your neighbor as yourself.” (Mark 12:29-31, WEB). When we respect God and love Him as we should, obedience falls into place. Jesus said, “If you love me, keep my commandments” (John 14:15, WEB). Our respect for His right to tell us how to live, along with a deep love for our Savior, inspires us to follow commandments like “you shall be holy, for I am holy” (Lev. 19:2; 1 Pet 1:16). And that gives us the ground-work for truly following Him with His law written inside us, not just as part of an outward show. The Lord wants our hearts. He wants us to respect Him and His authority because we love Him so much that we long to do what He asks.